Affordable Pools is the leading gunite pool remodeling and restoration company in the New England region. With years of experience bringing dull pools back from the brink of disrepair, Affordable Pools knows how to help clients make the most of their swimming pool and spa with high quality products that will last for years to come. We offer a variety of pool restoration products, including many popular pool surfaces like plaster, Marcite, QuartzScapes, JewelScapes, PolishScapes, QuartzScapes, Diamond Brite, River Rok, Hydrazzo, and pebble pool surfacing styles. We also offer and install pool tile in lots of colors and finishes from the leading tile resources in the industry. Affordable Pools works hard to give its customers a fair evaluation of their existing pool and lay out each option for pool repair. 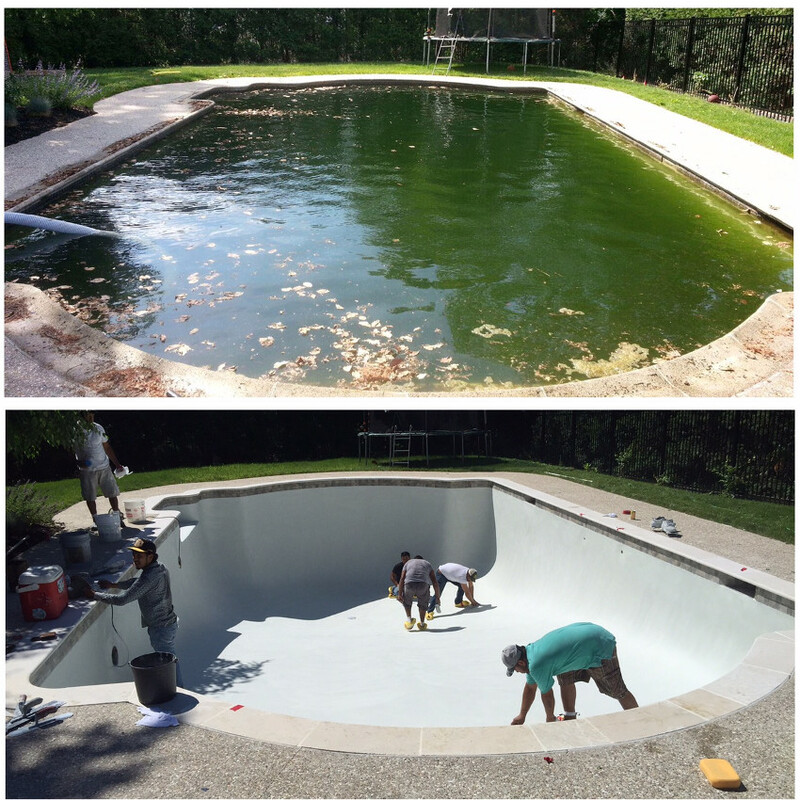 We offer a free estimate to our Boston – New Hampshire – New England wide pool remodeling clients and are available to explain each pool resurfacing option to help them make the right decision for their home and family. Call us to schedule an appointment, or contact us by email and get your Affordable Pool today. When you think of pool plaster, you normally think of the smooth, white pool plaster surface that turns a sparkling blue when filled with water, but there are actually many choices that can be made. 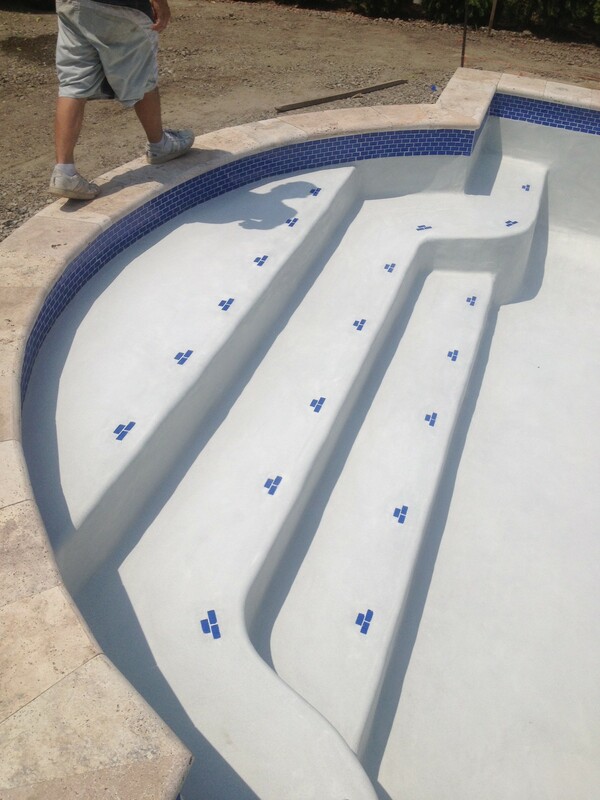 We offer many different colors that can be applied with the plaster to your swimming pool surface. Plaster, although not the best, has been, until recently, the most common pool surface. People are familiar with it and it’s the least expensive of pool surfaces. Most traditional plaster is white cement mixed with limestone or marble sand. By its nature, plaster has certain limitations. Its porous surface is the most susceptible to staining and bacteria growth. Because plaster constantly reacts to water, plaster pools “use” more chemicals to maintain a balanced water chemistry and plaster typically does not last as long as other surfaces. A new plaster surface will give 5 to 10 years of good service. A Diamond Brite and QuartzScapes interior pool surface is actually a plaster surface with man made quartz aggregate mixed in. There are two benefits with Quartz. First, Quartz is a very hard material. And because a percentage of your pool interior surface is now covered with a hard, non-porous, stain-resistant material – quartz pool plaster – you have a more stain-resistant, more durable and longer-lasting surface than plaster alone. Second, people like Diamond Brite or QuartzScapes because you can introduce a variety of colors into your pool interior with it. Quartz Pool Plaster is priced slightly higher than traditional plaster. You can expect a new Quartz Plaster surface to give you 10 to 15 years of good service. A pebble pool surface is also a plaster surface with pebble aggregate mixed in. The pebbles actually comprise the majority of the surface of the pool, with the obvious advantages. It is the most stain-resistant and most durable surface available. And you can select from many different interesting colors which will produce a myriad of water colors. The pebbled finish is reminiscent of a mountain stream or lake bed. We offer the family of pebble finishes, such as StoneScapes, River Rok, the original PebbleTec® as well as PebbleSheen® and PebbleFina®. They have proven to be the finest the industry has to offer. A variety of colors are offered which create unique finishes and water colors in your pool. Pebble surfaces are more costly than traditional plaster. However, in the long run they tend to be more economical to maintain. You can expect a new pebble surface to give you 12 to 20 years of good service. Please feel free to contact us for a presentation in greater detail of the different surfaces and a free no obligation price quote. Affordable Pools is proud to offer and install a variety of tile finishes and colors from the leading tile resources in the industry. First a saw cut with a diamond masonry blade is made to undercut the tile line to preserve the existing swimming pool tile, unless new tile is being installed, then the old tile is removed. The pool is checked for loose plaster, which determines if we need to remove the plaster down to gunite, or bond coat the surface of the pool. While bond coat is the preferable way to prep your pool for plaster, sometimes the old surface is in such poor condition that all the old plaster has to be chipped off down to the gunite. All plaster chips and waste material will be cleaned up and hauled away. If the pool cannot be bond coated we use hand held chipping tools to remove the existing plaster down to the original gunite in a narrow band under the tile and around all penetrations of the plaster shell. The purpose of this is to give a nice smooth even transition where the new plaster meets the tile and other penetrations. Gunite Pool Remodeling servicing Boston, New Hampshire, Massachusetts, greater New England, Acton MA, Arlington, Peabody, Bedford, Haverhill, Billerica, Cambridge, Chelmsford, Burlington MA, Windham NH, Hollis NH, Nashua NH, Westford MA, Londonderry NH, Pelham NH, Reading MA, and Andover MA As Well as Many Other Towns served.